The AAMA Supplier of the Year Award winners exemplify the elite in manufacturing innovation, commitment to excellence, dedication to employees and community investment. Share the story. Great companies have great stories to tell that are often never shared. Recognize the hard work and dedication of the employees whose contributions are key to the company’s success. Promote the excellence in Alabama’s automotive industry. Join the ranks of notable manufacturers and service providers. Gain well-deserved news coverage for the company’s outstanding achievements. Increase public awareness of Alabama’s automotive manufacturing and service provider community. Applicants must be manufacturers or service providers with significant operations in Alabama. Self-nominations are accepted and strongly encouraged. Winners will be selected from three categories: Large manufacturer (Employee base of 200 and over), Small manufacturer (Employee base under 200) and Service provider. Submit the completed form by email to [email protected] by January 11, 2019. The nomination will be reviewed for eligibility and the company will be notified of the nomination. The nominee’s application will be reviewed by a team of judges. Finalists will be evaluated during a site visit in April 2019, including an interview to verify the application information and a plant tour (if applicable). 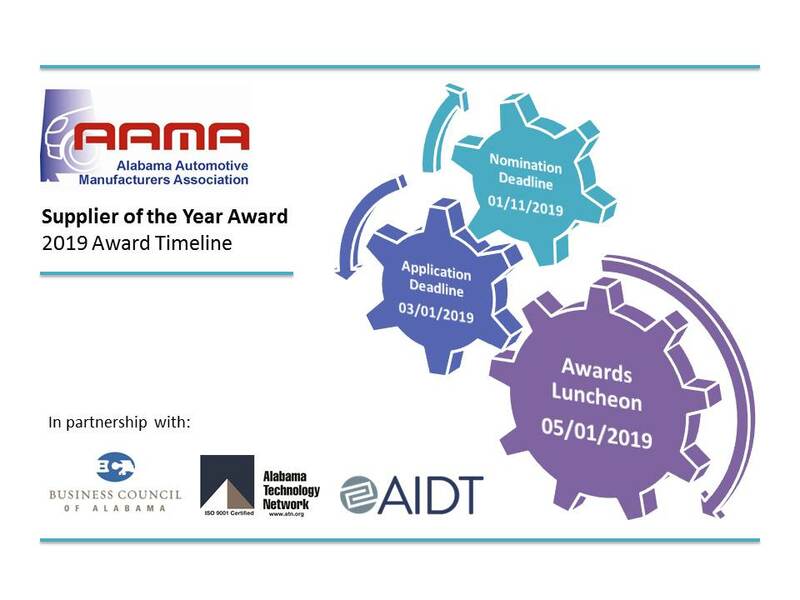 Winners will be announced at the 2019 Business Council of Alabama Manufacturer of the Year Awards Luncheon on May 1, 2019. All nomination materials will be treated as confidential and used only for the purpose of selecting a winner for this award. Judges are required to handle all information confidentially and not communicate, copy or transmit any information about a company to any other party except the judging committee and the award administrator. Original applications will be returned if requested. Complete responses to all questions are required for accurate evaluation of applications.